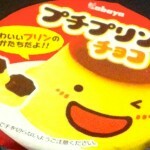 Review: Kabaya Puchi Purin Chocolate (Little Chocolate Puddings) | Oyatsu Break! My husband is delightful, and for Christmas he got me an assortment of Japanese candies for the blog. I love that guy. 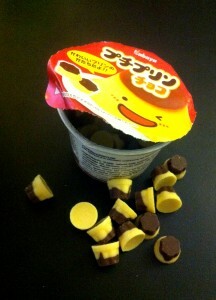 One of the delightful candies I found in my stocking was this kid-oriented confection from Kabaya, “Puchi Purin Chocolate” which translates roughly to “little chocolate puddings”. Delightful! Not something I’d generally pick up for myself, but I do love Japanese puddings and I was so happy to get them! Thanks honey! Packaging: Being as these are official imports to Canada, they feature a big ugly ingredients/nutrition sticker over about 1/3 of the package, but what’s left is just adorable! The package is shaped like a Japanese purin (pudding) snack which is already amazing, and the lettering is round and friendly and cute! 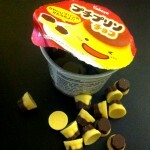 It also take the effort to show what the candies inside look like with a photo/illustration–a pudding with chocolate at the bottom turned upside down. 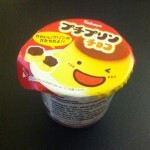 The top of the package features a traditional ‘real’ purin with an adorable face on it, covered in caramel. I was kind of expecting that these would be caramel pudding-flavoured candies because of that, and so I was surprised to read that they were chocolate in the description…maybe a bit confusing The best part though is the cute little pudding face is saying how it is a cute-shaped pudding! Kids must love this. 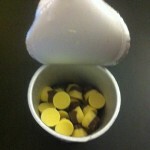 Scent: The scent is sweet and has a strong ‘candy’ flavour, with bits of caramel and chocolate. It’s pleasant. Taste: Well, as befitting a candy for kids it’s a little one-note. The main flavours are a sort of generic white chocolate and a bit of milk chocolate, but the pudding flavour (sweet/eggy) does round out the flavour just enough. 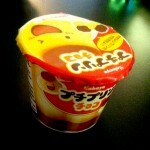 There’s also the tiniest hint of the caramel that would be on a regular purin. The flavour on first bite isn’t that notable, as I mentioned, but over eating the small package (34g, 202 calories) it builds appreciably and satisfyingly. By the time I got to the end of the package I’d say I enjoyed this little candy, but I also didn’t need anymore either. Perfect size. Verdict: This is definitely a great little candy treat for kids, but I think adults (myself included) generally demand more complicated or challenging flavours. Even the blandest Kit Kat had a bit more going on then these treats, for example. That said, they’re well balanced, not overly sweet, and tasty-enough little snacks that any kid would be happy to be treated to.